Sometimes being--hm...how should we say this?--not so bright can be helpful. Just ask Harry and Lloyd! These two classic characters got to go on a cross country adventure spending lots of money and writing I.O.U. notes to cover it. When they purchased their fancy suits for a swanky dress benefit, Lloyd went with a flashy orange number, but Harry chose a much more subtle, sky-blue color. 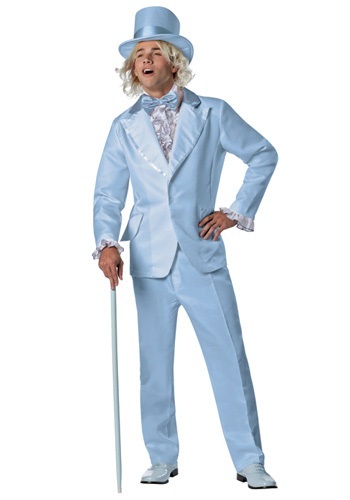 So if you want to look just like him, pick up this Blue Dumb and Dumber Harry Costume, a long blonde wig, and one of our cool blue canes. You wouldn’t want to groom a dog in this suit, but it would be perfect for a Halloween jaunt through the neighborhood! Of course, we can’t promise that once you slip into this light blue tuxedo jacket with attached white sleeve cuffs and the matching blue tuxedo pants you won’t be pursued by a few career criminals in hot pursuit of their beloved briefcase. But we can promise that you’ll look sensational as you get chased through the country. So there’s that. Ignorance is bliss, right Harry? You can’t buy a Lamborghini Diablo just by looking good, but with this costume’s light blue bow tie, top hat, cummerbund, and dickey, but you can have a wild Halloween adventure. That’s almost as good as a really nice car. Dress a buddy in Lloyd’s orange suit and at least you’ll have someone to play tag with on the walk back home at the end of the night.